With good hips thanks to good breeding practices, a fallen log is child's play. German shepherd puppies are similar to toddlers, except toddlers actually sleep occasionally. Shepherds are busy, speedy and noisy, but above all, loveable black, beige and the occasional white bundles of joy. But choose one from a negligible breeder and a list of medical problems can creep up a few years down the road. Choose a reputable breeder. Anyone can breed German shepherds and sell the puppies, and that includes people who don't have any business breeding dogs. 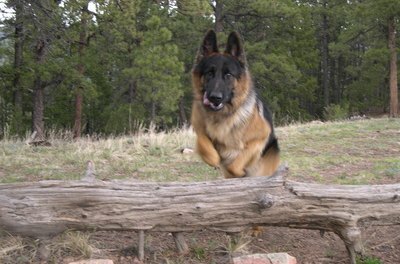 Negligence and ignorance largely contribute to poor health later on in a German shepherd's life. Solid breeders have a good reputation in your community, they're knowledgeable and they're willing to answer any questions you may have. And they're not the type to offer unsafe advice, such as saving on vet bills by giving the puppy his much-needed shots yourself. Ask to see the father and mother. Check out the overall health of the parents, making sure that they don't have physically visible ailments. 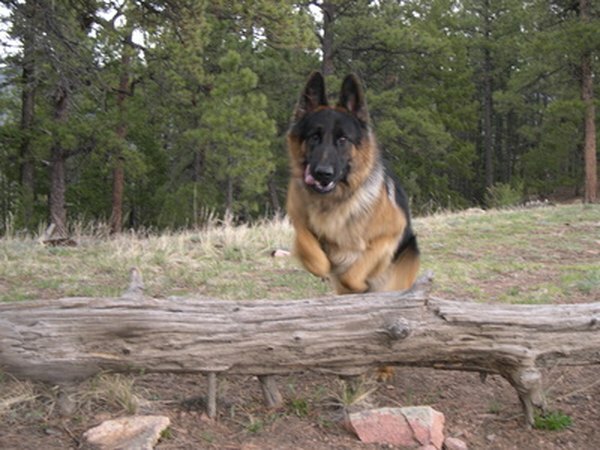 Many German shepherd conditions are hereditary, such as hip dysplasia. If the parents exhibit symptoms, chances are high that your pup will eventually too. Also make note of aggressive parents, which indicate the puppies may be aggressive. The parents should appear aloof, but never aggressive. If one of the parents if missing, hightail out of there. That means the breeder likely doesn't even know if both parents were German shepherds. A Shetland sheepdog and shepherd mix, for example, might look like a full-blooded shepherd when young, but the differences start to show themselves later down the road. Hold the pup that's caught your eye. Make sure he's not infested with fleas and that he looks well-groomed. If the puppies aren't well-taken care of, the breeder has no interest in anything but getting your money. Ask to see papers. Reputable breeders will have no problem whipping out American Kennel Club registration papers, Orthopedic Foundation for Animals hip and elbow certifications and vet papers that confirm all necessary shots have been administered. The OFA certifications apply to the parents only, as dogs under 24 months cannot be screened. If the parents have good hips and elbows, the chances are better that their puppies will too. Take the puppy home for a few days or a week. Good breeders don't have a problem with allowing you to take the puppy home to make sure he's a good fit for you and your family. Many breeders encourage that you do so. Ask if you can contact someone who has bought puppies from the breeder before. The breeder won't be able to give you phone numbers on the spot because of privacy issues, but shouldn't have a problem with setting up a call between you and a previous buyer. Schedule a checkup with your vet. Seeing on paper that the puppy has received his shots and all proper medical attention is all well and good, but there's nothing like hearing the youngster's fit and healthy from your own vet. If you ever have a bad feeling about the breeder, just leave. There's plenty of other places you can find a new furry family member. Do Purebred German Shepherds Have Black Spots on Their Tongues?